There are substantial generational differences on a number of foreign policy attitudes and, in some cases, these differences have widened in recent years. About a decade ago, for instance, similar majorities across age cohorts agreed that the best way to ensure peace was through good diplomacy, rather than military strength. 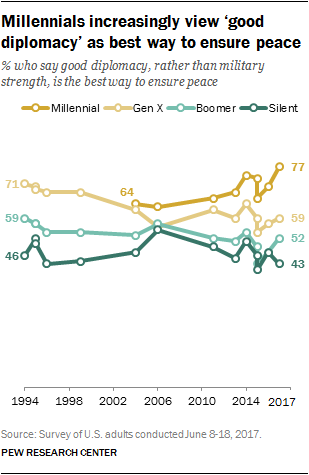 But Millennials increasingly view good diplomacy as the best way to ensure peace, while the share of Silents who take the opposing view has grown in recent years. Opinions among Boomers and Gen Xers have changed more modestly since the mid-2000s. Generational cohorts also differ over America’s relative global standing, as well as the extent to which the United States should compromise with its allies. On the other hand, generational cohorts have more similar views of whether the U.S. should be active in world affairs. An overwhelming share of Millennials say that good diplomacy – rather than military strength – is the best way to ensure peace. About three-quarters of Millennials (77%) see diplomacy as the better way to ensure peace, compared with about six-in-ten Gen Xers (59%), half of Boomers (52%) and roughly four-in-ten Silents (43%) who say the same. Across all generations except Silents, more say good diplomacy rather than military strength is the better approach for ensuring peace. Silents are divided: 48% say military strength is the better path to ensuring peace, and 43% say good diplomacy is better. Since 2006, the gap in opinions between Millennials and Silents on this question has grown substantially. At that time, 63% of Millennials said good diplomacy was a better way to ensure peace; 77% say that today. By contrast, the share of Silents who see good diplomacy as the better approach has declined from 55% to 43%. Overall, the public is evenly divided on whether the U.S. should be active in world affairs, or concentrate on problems at home (47% each). The share saying the U.S. should be active in world affairs has increased 12 percentage points since 2014. Millennials, by a modest 51% to 44% margin, say the U.S. should focus on problems in this country. Gen Xers, like the public, are evenly divided. Silents and Boomers are slightly more likely to say the U.S. should be active internationally. There are sharper generational divisions on views about how the U.S. should balance its own interests and the interests of its allies, with the differences most pronounced between the oldest and youngest generational cohorts. Silents are divided over whether the United States should follow its own national interests, even when allies strongly disagree (43% say this), or take into account the interests of allies even if it means making compromises (48%). Support for the U.S. taking allies’ interests into account is higher among younger cohorts. 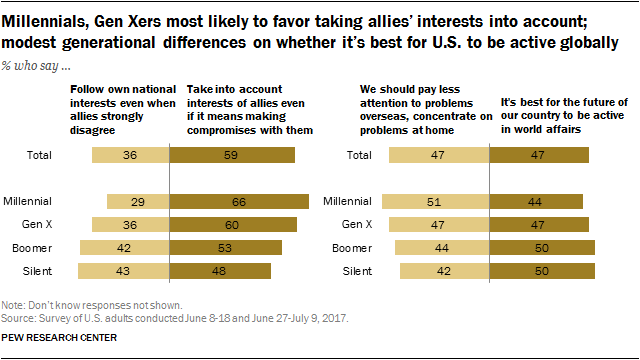 Six-in-ten Gen Xers and 66% of Millennials say the U.S. should pay heed to the interests of its allies even if that requires compromises. Silents are also substantially more likely than those in younger generations to say the U.S. “stands above all other countries in the world.” Nearly half of Silents (46%) say this, while an identical share say the U.S. is “one of the greatest countries in the world, along with some others”; just 7% say there are countries that are better than the U.S. 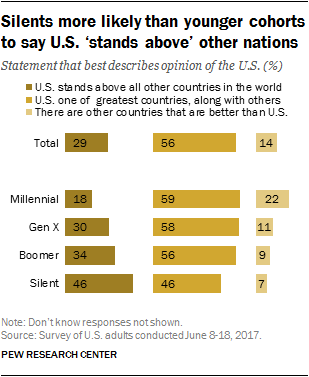 Among the three younger generations, the majority view is that the U.S. is among the greatest countries – but does not stand alone. About a third of Boomers (34%), 30% of Gen Xers and just 18% of Millennials say the U.S. stands above all other nations. While just 22% of Millennials say there are “other countries that are better than the U.S.,” that view is even less widely shared among older generations. While majorities of those in all generations say America’s openness is essential, the view is more widely shared among those in younger generations: An overwhelming majority of Millennials (80%) say America’s openness to others is essential, compared with 68% of Gen Xers, 61% of Boomers and 54% of Silents. Though younger generations are more racially and ethnically diverse than older generations, there are only modest racial differences in these views in the overall public, and the generational pattern of opinion is nearly identical among whites across generations. For instance, 79% of white Millennials, compared with 52% of white Silents say the country’s openness to people from all over the world is essential to who we are as a nation. There are stark partisan differences in views of whether or not openness to people from around the world is central to America’s national identity. Partisan divides are evident in all generations, but among both Republicans and Democrats, younger generations are more likely to view America’s openness as essential. Among Republicans, Millennials are the only cohort in which a majority (61%) views America’s openness as essential to the nation’s identity. About half of Republican Gen Xers (46%) say this, as do 42% of Republican Boomers and just 38% of Republican Silents. The view that openness to people from around the world is an essential part of America’s identity is held by majorities of Democrats across generations. But it is more widely held among Gen X (87%) and Millennial (91%) Democrats than among Democratic Boomers (78%) and Silents (68%). Overall, 49% of the public says that the Islamic religion does not encourage violence more than other religions, while slightly fewer (43%) say it is more likely than others to encourage violence among its believers. Overall opinion on this question is little changed over the past decade, but the partisan gap on this question has widened as a growing share of Democrats say Islam does not encourage violence more than other religions, while the share of Republicans who say that it does also has grown. As has been the case since Pew Research Center first asked this question in 2002, those in younger generations tend to be more likely than those in older generations to say Islam is no more likely than other religions to encourage violence. In the 2017 survey, Silents are the only group in which more say the Islamic religion encourages violence (53%) than say it does not (36%). 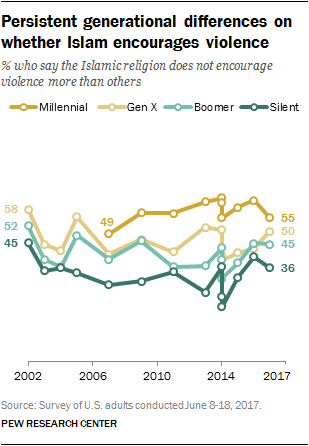 Boomers and Gen Xers are divided in views of Islam and violence, while Millennials are the only generation in which a majority (55%) says Islam does not encourage violence more than other religions. On the broad question of whether global economic engagement benefits the U.S., 65% of the public – and majorities across generations – say U.S. involvement in the global economy is a good thing because it provides the U.S. with new markets and opportunities for growth. Just 29% of Americans say it negatively affects jobs and wages in the U.S. There are much wider generational differences over whether the North American Free Trade Agreement (NAFTA) is good or bad for the United States. 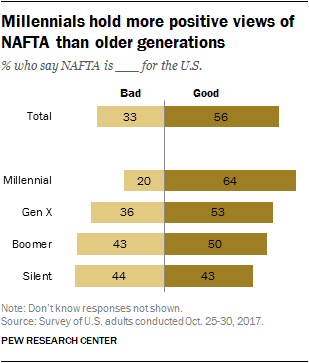 A majority of Americans (56%) have a positive view of NAFTA’s impact, while a third say it is bad for the U.S.
By about three-to-one (64% to 20%), more Millennials say NAFTA is good for the U.S. than say it is bad. Older generations are less positive about the trade pact. Among Silents, roughly as many think NAFTA is bad (44%) as good (43%) for the United States.